How to download the contents of a board in PDF, Word, Markdown or plain text formats. 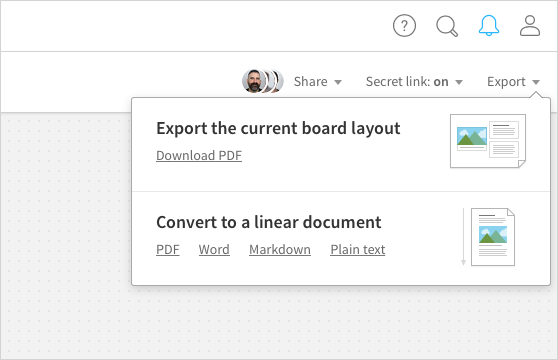 You can export any board as a PDF, Word, Markdown or plain text document. The Canvas PDF option creates a printable PDF of the original layout. Exporting is great for printing out a board, sharing work with clients, or just getting data out of Milanote in a standard format so you can use it in other places. The only board you can't export is your home board.